This time last year Connacht were working their way to a first Guinness Pro 12 trophy and Champions Cup rugby. Twelve months later they are facing a possible play-off against the French or English to qualify again. It is hardly the position they expected to be in - certainly not returning to Parma to play Zebre in the refixed Pro 12 game this Saturday - when Irish eyes are in Thomond Park. That is fixture, which was called off earlier in the season due to torrential rain, is being played on the same day as Connacht could have been contesting a first Champions Cup quarter-final had they beaten Toulouse, makes it even more difficult. But it is a game Connacht will expect to win, with a bonus, and nothing else at this stage of the campaign will be satisfactory. "The main thing for us is this weekend is just concentrating on Zebre," says forwards coach Jimmy Duffy. "Whatever happens in terms of results is for further on and we will deal with it when it comes," he says. "Zebre will bring their usual game plan, they've got some really top players - international locks, tightheads, looseheads - and we have to show them massive amount of respect. Collectively they have shown that if we don't we couuld come unstuck." Cardiff, now just a point adrift, are pushing Connacht hard to take the first play-off place, but Duffy says the squad cannot afford to be sidetracked. "We are aware of who is above and and below us, but can't get side-tracked. We need to stay with the job in hand. We have to live in the here and now, because if you don't, you may miss something, and came unstuck pretty easily. "We would have liked to be further up the table, but it is what it is. Last year is history. There have been a lot of changes, but we are building nicely, and to be honest, the mood in the camp is positive." 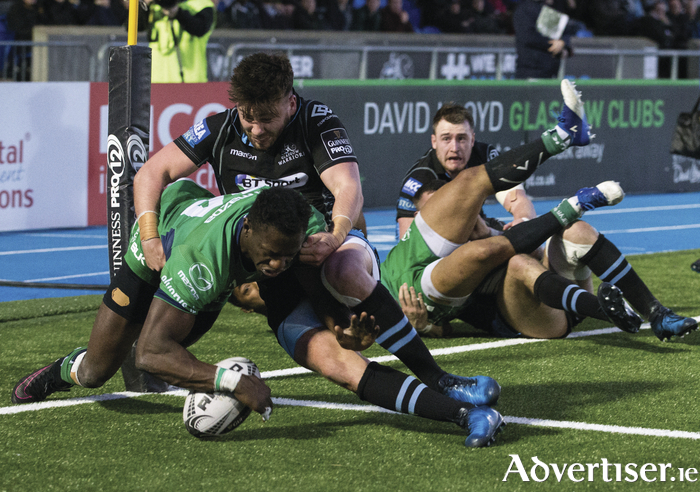 Connacht will also will be taking the positives from their recent 34-25 loss to Glasgow - particularly the chances created. "Ultimately we have to admire the effort, but we blew a few scoring opportunities and gave away a few," said coach Pat Lam. "It is just disappointing. We had a genuine chance. The score reflects the game, but to get nothing out of it is frustrating. "All we have to do is keep playing and get all the points we can. There are still five rounds for us, four for everyone else, and we will see where we are on the last weekend. "There is a big gap between ourselves and Cadriff and the rest, so no doubt the play-offs, and we always knew our main battle would be with Cardiff because of this thing where there has to be one from every country going through. It is an area that needs to change. I've said it before, the top seven should go through."